Don't be fooled by this fatso. The Acer Chromebook 15 C910 is a durable workhorse that will reward you for looking past its size in favor of its performance. If you’re considering the Acer Chromebook 15 C910 at $479 (about £360, AU$647) for your next laptop, then you’d better have big ideas. When compared to other Chromebooks the C910 has a bigger screen, bigger processing power and a bigger price tag. 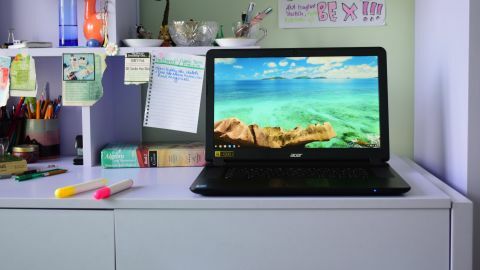 The Acer Chromebook 15 C910 is specifically geared towards students and teachers, thanks to its rugged design and pleasing aesthetic. This means that the C910 is perfectly suitable for any consumer who doesn’t mind lugging around a few extra pounds and inches. Thanks to its Core i5 processor and 15.6 inch display, the C910 is unlike most other Chromebooks you’ll come across on the market. Its closest comparisons are the Asus Chromebook Flip and the premium Google Pixelbook, but at less than half the price of the latter. This means the Acer Chromebook 15 c910 may just be the best Chromebook for the right person. Although similar in stature to the Pavilion, and similar in power and price to the Pixel, the C910 stands alone as the colossus of Chromebooks. The first thing you'll notice about the C910 is how big it is. Tipping the scales at a whopping 4.85 pounds (2.19kg), the C910 outweighs the 12-inch Pixel and the 14-inch Pavilion by 1.5 and 1.4 pounds, respectively. Carrying the weight is a chassis that measures 1.0-inch (2.5cm) tall by 15.1-inches (38.3cm) wide by 10.1 inches (25cm) long. This is a substantial notebook that is not ideal for people who will be running from meeting to meeting or coffee shop to coffee shop. It is, however, perfect for students and teachers who will be sitting at desks for long periods of time. Housed in a gorgeous black, fabric-textured chassis with a diamond matte finish, the C910 immediately improves the style of any desk space. Although the matting is a pleasure to view and touch, it does easily collect dirt and smudges. One quick wipe of the surface will remove most (but not all) of the damage. Parents beware: this laptop is not going to break or chip if your child drops or smashes it, but it won't look brand new in a year if your child plans to transport it back and forth between home and school. If you're one of those parents who likes to keep things shiny, you might want to look at carbon fiber or magnesium alloy laptops. For adults who take good care of their belongings, the shell should be fine so long as you don't place items on top of it or inside the same carrying bag. The laptop's 15.6-inch full HD (1,920 x 1,080 resolution) display is a delight. You'll be able to enjoy movies, browse the web and play games for long stretches without feeling much eye strain. Parents who enjoy watching movies with their children will appreciate the screen's wide viewing angles, which enable you to seat three people four or five feet away from the device without noticing any shadowing along the edges. Although this display is pretty sweet, it doesn't compare to the Pixel 2, which sports a 2,560 x 1,700 IPS touchscreen. You can touch the C910's screen all you want, but it won't respond. I wish Acer had dedicated more top panel real estate to the screen. You get about half an inch of space along the screen's border. This space would have been better served by stretching the screen out a bit to further enhance the viewing experience. The same can be said about how the keyboard and touchpad are designed. Acer dedicated about three of the keyboard deck's 15.1 inches of width to the laptop's adequate but not marvelous top-facing speakers. The TouchPad, which is somewhat hollow and creaky, takes up three inches, and the keyboard takes up a little more than five inches. This makes navigation somewhat uncomfortable, especially for people with tiny fingers and little experience typing (i.e. children). Acer should have expanded the keyboard and keys, reduced the width of the speakers, and cut the TouchPad in half.